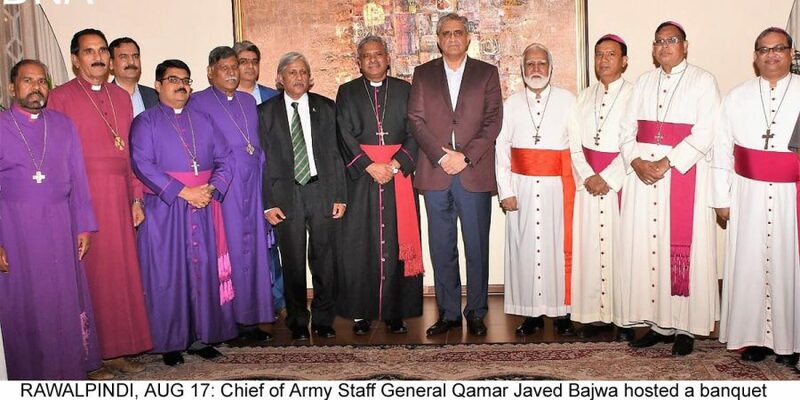 RAWALPINDI, AUG 17 (DNA) – Chief of Army Staff General Qamar Javed Bajwa (COAS) hosted a banquet dinner in the honour of leading Christian clergy in Pakistan. The dinner was attended, among others, by His Eminence Cardinal Joseph Coutts and Right Reverend Humphrey Sarfraz Peter. Chief of Army Staff regarded the appointment of Cardinal Coutts as a great national honour and a milestone towards fostering national harmony and accord. In their notes of gratitude, Cardinal Coutts and Reverend Peter appreciated Army Chief’s gesture as an inspiration for Pakistani minorities to take greater and more active part in nation building and in restoring their faith in a cohesive and tolerant society. They expressed their resolve to take steps for more positive role by Christian community towards national development and progress.